There is a growing momentum towards specialized “text editors” these days, and these tools are not meant for “geeks” or “hackers”, far from that: there are targeted at people who write long chunks of texts, and only text. You may have already guessed who they might be: fiction writers, journalists, etc. There is now a nice ecosystem of tools, most of them non free software, like Scrivener, that is in full expansion. If I’d tell you office suites can offer just the same benefits, you would call me biased. And indeed I might be. Just a tad…. But it’s true. On the other hand, people having specific needs in the way they write and edit texts are very real, from developers to fiction writers. 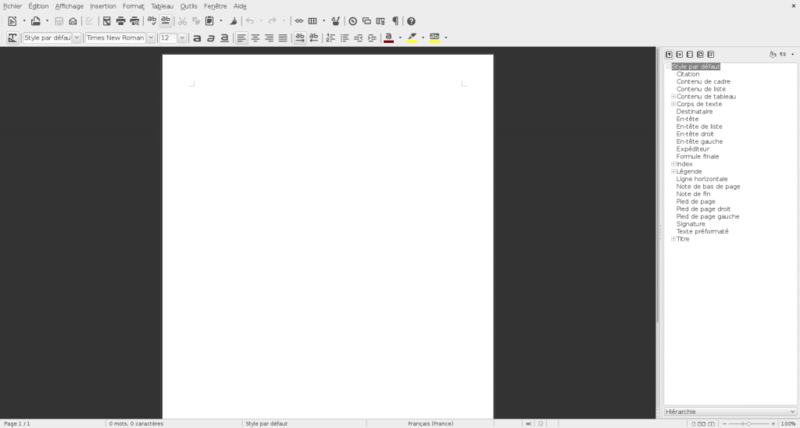 The question is: should an office suite like LibreOffice accomodate everyone – and does it already? I will first show how to turn LibreOffice into a distraction-free text editor -yes you can do that quite easily- and then I will try to answer the question above: should an office suite like LibreOffice accomodate everyone? in an attempt at defining what LibreOffice, and especially Writer, is and does as a tool. 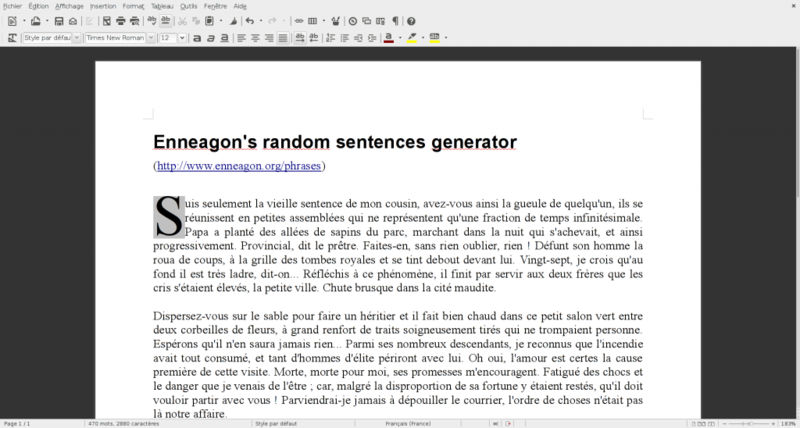 The whole point of the following suggestions is to take away elements from LibreOffice’s writer interface. 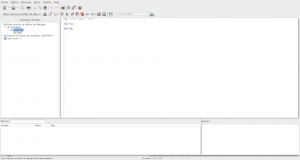 Take away any unwanted toolbar from the same View menu (then use the Toolbar submenu), such as Drawing or WordArt bars. Don’t get me wrong: you could make every bar disappear but it’s not helpful: just get rid of what you think is clutter. In the Options menu go to Writer, Appearance, then change the Application background to a shade of dark grey (70 up to 90%). Do not mistake this with the document background, there’s a specific entry for the Writer background. The last step is optional: get rid of the Stylist vertical integration. Many people do not have this as a default, I do because it makes me save time when I have to select styles as I’m typing a document. To me, it’s not clutter so I left it that way. Below is a screenshot of LibreOffice in distraction-free mode with the stylist nested on the right, while the second screenshot is the same configuration of LibreOffice without the nested stylist. Why do I mention the stylist? Because using styles is pretty much the single most important tool you need to be familiar with when using an office suite. Any office suite, that’s to say, otherwise you will end up wondering why office suites are so complex when you just have to type a letter to your insurance company… although there’s certainly a huge userbase for that. What do styles do? They structure your document visually and logically. They make the difference between a simple text with bold, underlined and italic words appearing from time to time, and an ordered document with chapters, sections, paragraphs that stands both the test of time (and format conversion) and multiple revisions or updates. They also help you create great looking documents and create templates. In a nutshell, using LibreOffice without styles is like driving a car in first gear or using Emacs only through the scratch buffer (that one’s for the geeks). By the way, the same is true for MS Office styles, but LibreOffice and its predecessor OpenOffice.org are known to handle styles in a consistently more powerful way. But styles cannot do everything. They cannot magically turn an office suite into a full development environment or code editor for instance. That would be pushing the enveloppe a bit too far. Which prompts the question of what an office suite like LibreOffice can, could and should do. It is clear to anyone who used an office suite and code editors or IDEs such as Emacs, Cloud9 (code editor in the cloud) , NetBeans or Eclipse, that LibreOffice serves different needs. There is no will, and no point for anyone to turn LibreOffice into a code editor (aside the macro and dialog editor that’s already embedded in the suite, as shown on the right), because an office suite is not and will never be a development environment. code editors: Seriously, some people need to drop that ball. I’m the first one to wish for a full blown html editor that works inside LibreOffice, but certainly not for a full suite with compilers and debuggers. These are specific tools, aimed at a specific range of uses. LaTeX editors: I have good friends who use these – in short, these are powerful tools allowing you to focus on text and then frame and format the text the way you want in a programmatic way. These editors require a lot of practice and learning before you can use them. 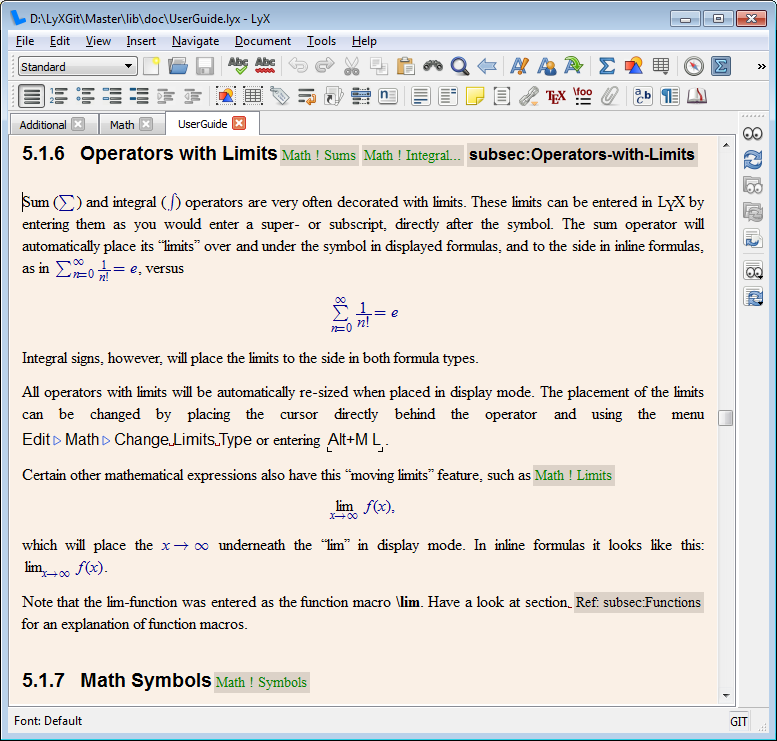 LaTex editors are used mostly in academic fields. They are not word processors, and to be honest, the notion that you must spend years of training to design a document in LaTex even in 2014 strikes me as nonsensical. wordpads, simple text editors: a word processor can definitely do that, but you could of course use something less complex, if all you need is a simple text editor such as TextEdit or WordPad. online pads; if you were to implement a collaborative stack in an office suite, it could actually be turned into an etherpad/framapad type of tool, although the value of a word processor may lie elsewhere. At this stage then, it becomes useful to try to define what a word processor does and why it matters. A word processor edits and handles documents . Not code, not notes (although it could), only actual documents. Faced with this shockingly simple yet – in my humble opnion powerful – assertion, what do we do with it? Word processors help you read, edit, save, open documents in a very fast and relatively easy way compared to everything else. Documents are not only made up of words and sentences. They come with a structural logic, specific formating, styles, layouts and graphical elements. While it may appeal to one of the broadest audience on the earth (people who have access to a computer and would like to write a document, such as a letter or a book or a shopping list) it does not mean that word processors or office suites are made for everyone else except developers, engineers and fiction writers. It means word processors excel at editing documents in a powerful way without much of training (compared to a full fledged academic or technical cursus in learning vi, emacs, LaTex editors…) and this uncanny ability does not really exist among any other tool out there. Sure, if you spend four years editing a document in LaTex, you will likely learn enough to make your PhD. thesis look good. Sure, there’s a customized major mode in Emacs enabling some proper visual document to be edited, but you need to know and learn about it beforehand, customize it some more, get acquainted with the custom shortcuts, etc. I’m not berating these tools: I’m a regular and devout Emacs user myself. But I do love the comfort and smoothness of firing up LibreOffice Writer and write that nice memo or strategic overview for the Document Foundation just by pointing on the stylist, clicking, expressing my thoughts through the text I’m wirting, changing the fonts, run the spell checker, saving the document, closing it. Tomorrow, when I’ll open it, it will look just as good, and I might even make it look crisper for the benefits of my readers. How long will it take me? A couple of minutes. Ten, if I’m in the mood of changing everything. It cannot get any easier than that. Office suites, and especially word processors are powerful tools. They help create and develop one’s intelligence, and by sharing documents enhance the collective intelligence of groups and crowds. They are meant to be what the LibreOffice project strives to provide: engines of creation, tools for intelligence. 14 Responses to "LibreOffice, the distraction-free way"
Great article. There should be a configurable “distraction-free mode” option. The user could customise it via the Options panel, ticking boxes so that it includes such steps as the ones you list above. The option would be accessible via a single button in the “View” menu, just under “Full Screen”. With one click, one could enter or exit this mode. – going full screen — I think you considered this too obvious to say. – disappearing toolbars (i.e. when you hover to the side of the screen the toolbars reappear but otherwise they are absent). Apple Pages does this in full screen mode. On the whole, would you recommend using LibreOffice to write a book and output an ePub file? Not a complicated book with tables, bibliography and footnotes, but your average non-fiction book? I know that LibreOffice certainly can be used even for the complex output, but the question is whether you see a meaningful difference in ease of creating a professional quality, well-formatted book and then turning it into print and eBook versions without too much pain? I’ve read various pieces on this before, but not in awhile, and usually not as clearly and neutrally expressed as your piece above. If you haven’t done a blog entry on this question before, I’m sure it would be very useful to a lot of people. First it is perhaps useful to point out that I have never written a book. I wrote and edited once a document that was over one hundred pages with LibreOffice, and several documents around 80 pages with OpenOffice.org . They all had either complex formatting or at least several diagrams, charts and pictures. The editing went very smoothly. Now, I have never used the ePub export extension although I hear it’s pretty handy.As for the tool: I would need to know what other tool we can compare it to first. My guess is that a word processor allows you to write the content and work on the presentation at the same time. No other software lets you do that and in my opinion that’s what makes it so powerful. There are scenarios where you may not need it; and in this case tools like Scrivener could be just as handy. On the other hand, why bother with them when LibreOffice or, hum, MS Office are just about on every computer you can come across? Another point I completely forgot to discuss: When it comes to LibreOffice at least, there’s a breadth of document format you can work with. That’s not the case with distraction-free editors to my knowledge. Thanks for the thoughts. You’re right that MS Word can be used to format a book, but it’s not really designed to do that. Unless you understand the inner workings, its easy to make all kinds of mistakes that aren’t easy to correct. hmm, the templates idea is a good one I think, but it needs to do the job – otherwise no one will use it. Do you know anyone who could provide guidance? My guess would be that someone who knows these needs and someone who’s skilled at LibreOffice templating (not even a developer!) can make that happen. I would like to see even less distraction … why should I see all that formatting when composing a book? Even Windows Word 2.0 of the blessed memory had Draft View (https://bugs.freedesktop.org/show_bug.cgi?id=39080) and the similar truly no-distraction view is the only view of LyX (http://www.lyx.org/ … see http://www.lyx.org/images/about/main_window.png … the way it looks on the display is just optimized for viewing on the screen, it has absolutely nothing to do with the presentation on the paper (or PDF), works like charm). Realy a great article on what a word processor does and not does! You can simply choose View > Full screen!